That’s certainly no longer the case. Simpson has been active in the pest management industry for decades. Her resume not only includes serving as president for Dugas Pest Control of Baton Rouge, La., but as president of the board of directors for LIPCA, an insurance agency created and run by pest management professionals (PMPs). She was also president of the National Pest Management Association from 2012-13, a tumultuous time in its history. Simpson handled the abrupt departure of the then-executive director with aplomb, steering the association steadily in the right direction as it adjusted to and welcomed its next executive director, Pest Management Professional (PMP)Hall of Famer Bob Rosenberg (Class of 2013). But looking back, the college-aged Simpson originally had been focused on earning her accounting degree from Louisiana State University. She was not interested in pursuing a career at Dugas, a company founded in 1957 that her father, Doug MacPherson, purchased in 1973. She worked there during high school and college summers, but it wasn’t until after graduation and “not loving the job I had” that she seriously considered his offer of full-time work. “I came in to the office to take care of payroll and accounts payable, so that Dad could feel free to travel and concentrate on his duties as the 1979-80 president of NPCA,” she recalls, referring to the-then National Pest Control Association. 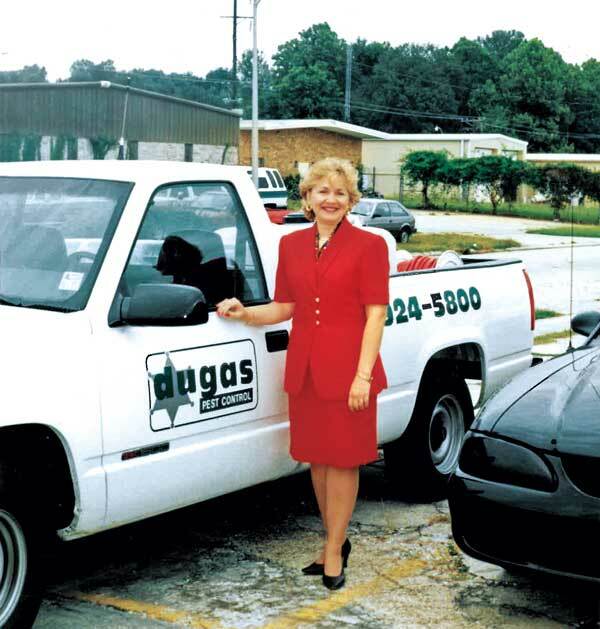 Dugas was “just a job” for Simpson until 1988, when she decided to take on the challenge of running the business. MacPherson welcomed his daughter’s newfound spark for Dugas, and in 2003 sold the company to her. Earlier this year, she became more involved with LIPCA. Her father was one of the founders and served as secretary/treasurer since its inception in 1986, but has since retired. In early November, Rentokil purchased Dugas Pest Control. Simpson took on a part-time role with the company as a consultant, and plans to retire in January. Son Jeremy Clark will stay on as a district manager. Simpson says she can rest easy as she looks forward to her next chapter.